Hey there, Im new here so I really hope this is in the right place. When I was growing up we had what my grandad called "A Tree Of Heaven" I used to play under that tree and love to look at the "furriness" that appeared on its branches gosh that tree seemed so big and it spread and spread mum and dad used to complain about it coming up everywhere and through the fence into the school field behind it lol. I would really love to have one again as it has many memories for me. I have no clue where to get one I have seen them growing along our road but none to buy. Would it be ok and possible at all to take a cutting and grow a tree of heaven? or would this been to hard to do? Also of course there is the problem of it spreading, our garden is mostly paved with only a little bit for plants along the side fence and two raised brick flower beds. Do you think one would suit this kind of space? If not ill have to make the most of admiring the one down our road as I walk the dogs!! I was real curious about you "Tree of Heaven", so I looked it up in wikipedia. I'm not sure you would want it in your yard. Check out what it says about it. It sounds pretty when you describe it and they have pictures. Is that the same one? Yes, it would grow in your paved garden. There was one growing in the 6 foot space between my driveway and my neighbor's. He kept trying to kill it, and back then, I didn't understand why. After he passed away, I began to understand. Those things were coming up all over my yard, roots invading my sewer system, a total mess! I managed to destroy it with finality this spring. I even paid to have the roots dug out. That's how much I detested that tree! I suspect your fond childhood memories of the tree are because you didn't have to pay to have the roots cleared out of the sewer system. You also probably didn't have to dig up all the doggoned volunteers that sprouted up every time nobody was looking. BTW, when I cut the branches off, in preparation for killing it, it stank to high heaven! Pheweee! I imagine it would start pretty easily from cuttings. Or if there is one up the street from you, just watch the area around it. They spread from the roots as well as by seedlings. I'm sure there will be baby ones you could dig up. But be careful, it is really an invasive, aggressive spreader. You might want to explore the possibility of planting one of the native 'look alike' trees mentioned in the article. Perhaps you could get the same appearance without all the problems? All very good advice offered above. Keep your childhood memories by foregoing the tree. In case any one is interested, Ailanthus is "The Tree That Grew in Brooklyn". If you haven't read this young persons book, you should. It was imported to the US in late 1800s for street tree plantings in our coal fired cities (The air was putrid then). It was about the only thing that could survive the coal fired grime and became the subjec to the book. Oh yes, a few other colloquial names..... paradise tree, Stinky Jims, sumac and not a few cursewords. I was excited to read the previous posting from valleytreeman. I love that book and it is very interesting to learn the name of the tree! 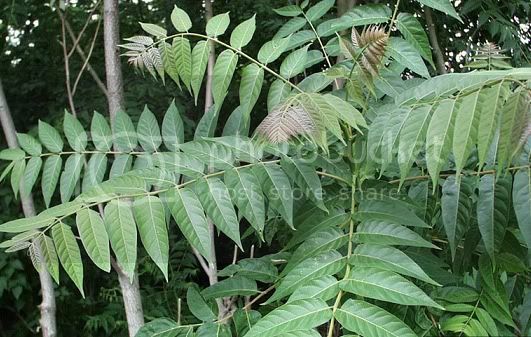 If you are still considering a Tree of Heaven for your yard I recommend not to. They are a very invasive, fast growing, and toxic to other plants. They are also very hard to get rid of. Total root removal or poison are the only real ways to do it. Trimming or cutting the tree actually strengthens it's root system and prompts the tree to send out more 'baby' trees. We don't have a tree in our yard but it has been a constant battle to keep the neighbor's tree out. For more information Penn State has a couple good articles. man, do they ever stink at 'that time of year'. ridiculously hardy (read: invasive) and pollution-tolerant, i guess it's little wonder why there are so many around.